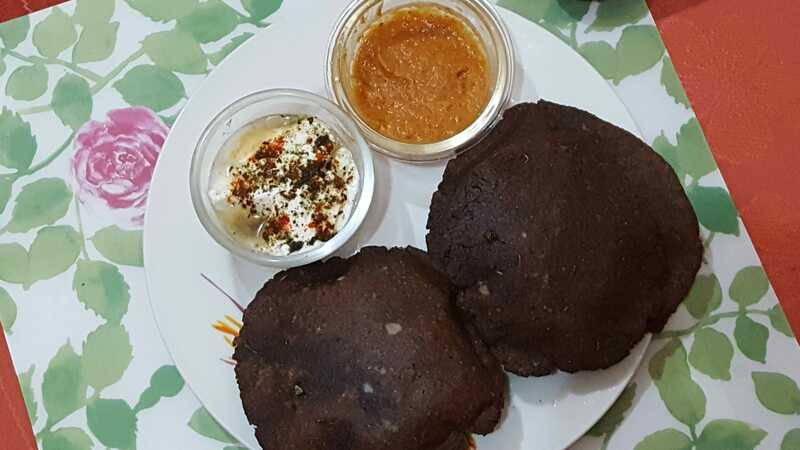 Kuttu ki puri is a common recipe made for Shivratri, Navratri upvas(vrat)or any fast. this puri can be made very easily.Kuttu and singhara ke atte ki puri is healthy and can be digested easily. Kuttu flour and singhara flours are both gluten-free. Take a big bowl mix all ingredients together and start to knead flour remember this dough should not be very soft, make it little tight and set aside for 15-20 minute. Heat oil in deep pan or kadhai on medium flame. Pinch out the small piece of dough, make it one round and flatten with palm start roll it to 3-4 inch diameter circle, with the help of dusting flour(kuttu 1/2cup additional).This puri should be little thicker than normal chappati or paratha. Start to fry puri with the high flame, turn and cook until its turn golden reddish brown, dry on paper towel and serve hot. SERVE with arbi ki subzi or potato ki vrat sabji, curd or chutney.